The Pentagon has approved a new policy that will allow troops to wear turbans and other religious clothing and engage in religious observances. Until now there has been no set policy in the military to allow accommodations for religion. Soldiers must apply for a waiver to be able to wear their religious garment or engage in a specific religious activity, which the military says they will take on a case-by-case basis. The Pentagon has approved a new policy that will allow troops to seek waivers to wear religious clothing, seek prayer time or engage in religious practices. Defense officials say the waivers will be decided on a case-by-case basis and will depend on where the service member is stationed and whether the change would affect military readiness or the mission. Until now there has been no consistent policy across the military to allow accommodations for religion. Now, for example, Jewish troops can seek a waiver to wear a yarmulke, or Sikhs can seek waivers to wear a turban and grow a beard. Others can request specific prayer times or ask that they be allowed to carry prayer beads or other items. The policy also says that service members can choose not to recognize any religion, according to NBC News. 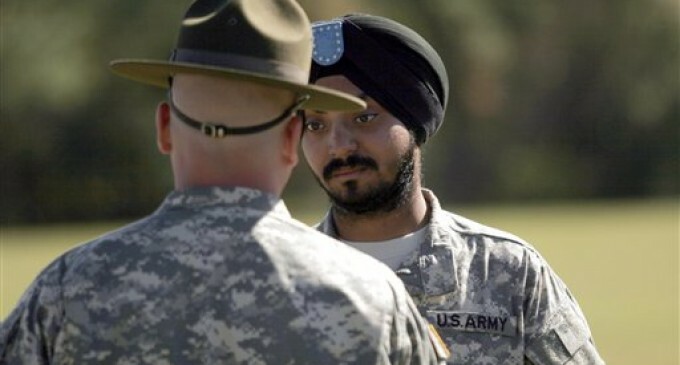 According to Defense Department statistics obtained by NBC, there are only three Sikh Americans in the military. There are about 3,700 Muslims. 6,300 Buddhists, and 1,500 Wiccans. The directive stresses that “the importance of uniformity and adhering to standards, of putting unit before self, is more significant and needs to be carefully evaluated when considering each request for accommodation,” according to NBC. Might as well hand America over to them as Obama is giving it to these brain wash muslins already. information, but great topic. I needs to spend some time finding out more or understanding more.